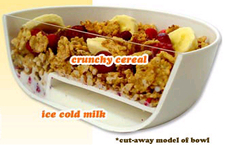 The eatmecrunchy cereal bowl was developed to have a unique shelf-design that keeps your cereal dry - meaning you’ll never have soggy cereal again. Niceone. That is flippin' genius. I'm getting involved, only $9 too!